All They’re Cracked Up to Be | Food It Yourself! Halloween night got me thinking about the kinds of treats I preferred when I was young enough to trick or treat. (For the record, that was during the Reagan administration.) I always liked the home-made treats best. These days all trick-or-treatable goodies must be in factory sealed packaging because of irrational fears regarding food tampering and safety. Hand crafted popcorn balls and scratch baked cookies are seriously suspicious and will be ejected from treat bags by hyper-vigilant parents. As a DYIeter, this new reality makes me sad. So, the next day I decided to try my hand at recreating a childhood treat. I decided on Graham crackers, partly because I like them, partly because I’ve been wanting to try making my own crackers and partly because I already had all the ingredients on hand. Graham crackers are named after their inventor Sylvester Graham. You can read about it him and his crackers on the Strait Dope website. The recipe is easy enough. Here are the 3 main parts. The butter and sugar are creamed together. 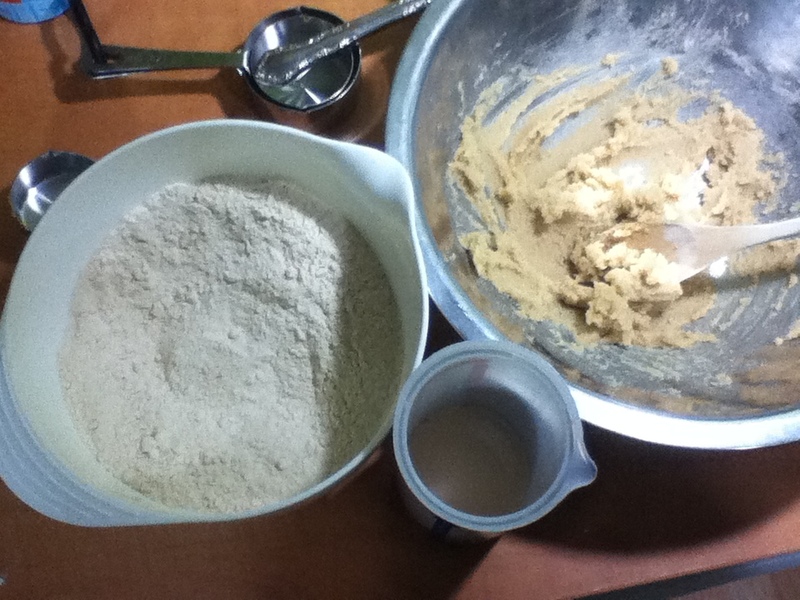 Then the wet ingredients (milk and vanilla extract) and dry ingredients (flour, salt, baking powder and baking soda) are added alternately a little at a time. 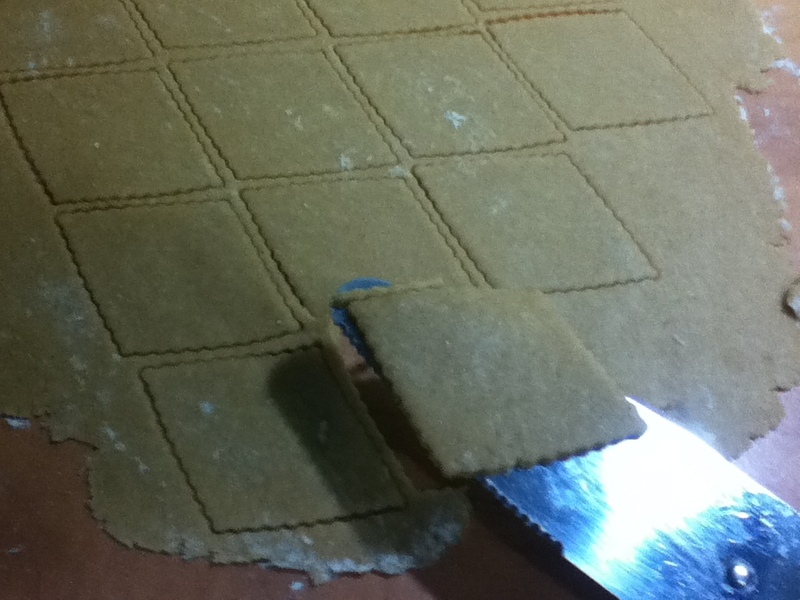 Then just roll it thin and cut out your crackers. 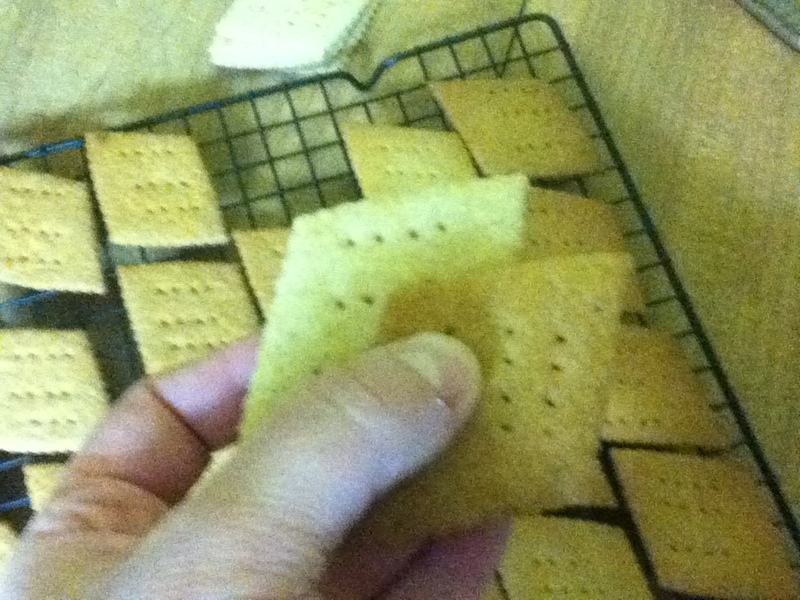 One fun part of making your own Graham crackers is you can make any shape you want. I chose diamonds. So much more sophisticated than snap-apart squares, don’t you think? The recipe didn’t specifically say to dock (poke holes in) the cut shapes, but I did it anyway using a fork. Then, it was 12 minutes in the oven. After a cool down, I tried one and…tragedy! They tasted fine, but were not crunchy. Mr. Food It Yourself confirmed that without the crackle these were not Graham crackers. I put the whole batch back in the oven and propped the door open to let steam out. Soon, toasty, crunchy little treats were mine! Before and after extra toasting. I like these Graham crackers better than store bought. They are less sweet and more wheaty. I ate a few while I wrote this. They were very inspiring and 100% worth the time to mix and roll. I am very glad I added the final toasting instead of accepting less-than-crisp crackers. When you’re making do it yourself treats, sometimes you need to make adjustments on the fly. Is there an old time snack you’ve been missing? Think you can’t make it at home? The internet is full of recipes, so get searching. You’ll get a yummy snack and a happy sense of nostalgia. What more can a DIYeter want?